aubunique | April 20, 2011 | Video by Frou Gallagher presented by Fayetteville Tree and Landscape Committee. John from http://www.growingyourgreens.com/ makes a special trip to Milwaukee to show you how YOU can grow in the winter time—in the snow! After watching this video you will know how you can grow in the snow. 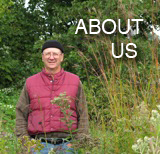 You will also learn more about what they are growing at Will Allen’s landmark urban farm Growing Power. Wildlife will make use of nature’s snags, dead wood, and stones. If your yard doesn’t have these items naturally, see if you can get neighbors and critters to pause at your property with something like this. wwtconservation1 | Mar 1, 2011 | How to make a creature tower, the second video in WWT’s Step-By-Step Rain Gardening series. KLRU | Feb 23, 2011 | Architecture, architectural plants, and organic crops come together on rooftop gardens that are pleasing to the eye and to the environment. Garden designer: Patrick Kirwin. Project architect: Thomas Tornbjerg of Bercy Chen Studio.